Yesterday I did a fair amount of painting, in short shifts between job applications and other stuff. These models are close to being finished. 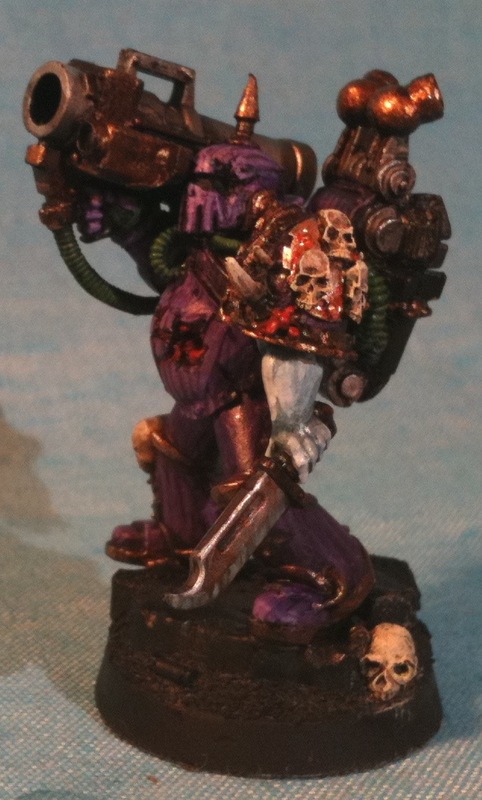 The plasma gunner is the closest to being done. I just need to do a little more work on his weapon and paint the tip of his horn. After I get most of the common stuff done I pick a figure and work on his extra bits primarily. Then when all the extra bits are done I do eyes and insignia. 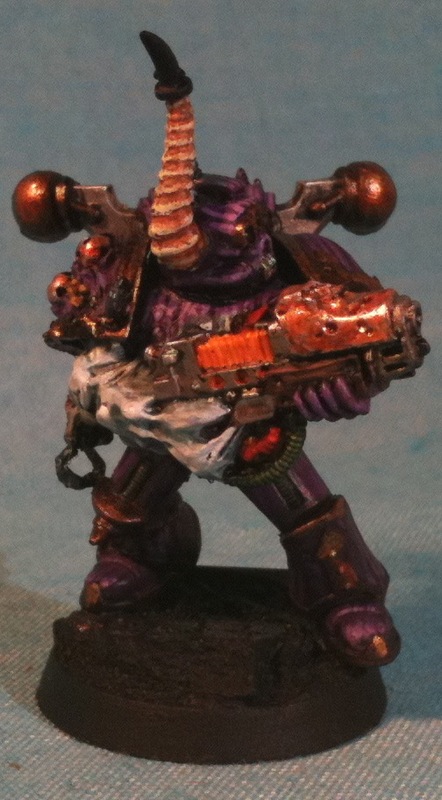 Lastly I do extra rust washes and seal the model. I leave the bases until fairly late in the process usually, but not always. Once you’re done the armor and trim you can do the bases most anytime. I’ve taken to using resin bases in most cases now as I paint so few 40K figures the extra cost and time washes away. For big blocks of infantry, such as in Warhammer Fantasy Battle it probably is less feasible. Some of the bases cost close to what a plastic figure costs or even more. I’ve tried a few manufacturers over the years these look like Dragon Forge to me. Jeff is probably my go to base guy, though I like the stuff coming out of Poland for characters too. Besides the rotting flesh, I painted the guts, and the unique copper metal color bits. I don’t have a copper so I made one with bronze, silver, and orange ink. I also painted leather bits English Uniform Brown Foundry Triad. The plasma gun coils were painted white, two coats, then two coats of Golden Yellow, then a Sunburst Yellow highlight, finally a thinned orange wash, the old blue lid GW one. I plan to paint on another layer of highlights and maybe get out the purples again for any armor touch ups then the Plasma Gunner is done. I’ll finish the lascanon guy next. He is mostly done. 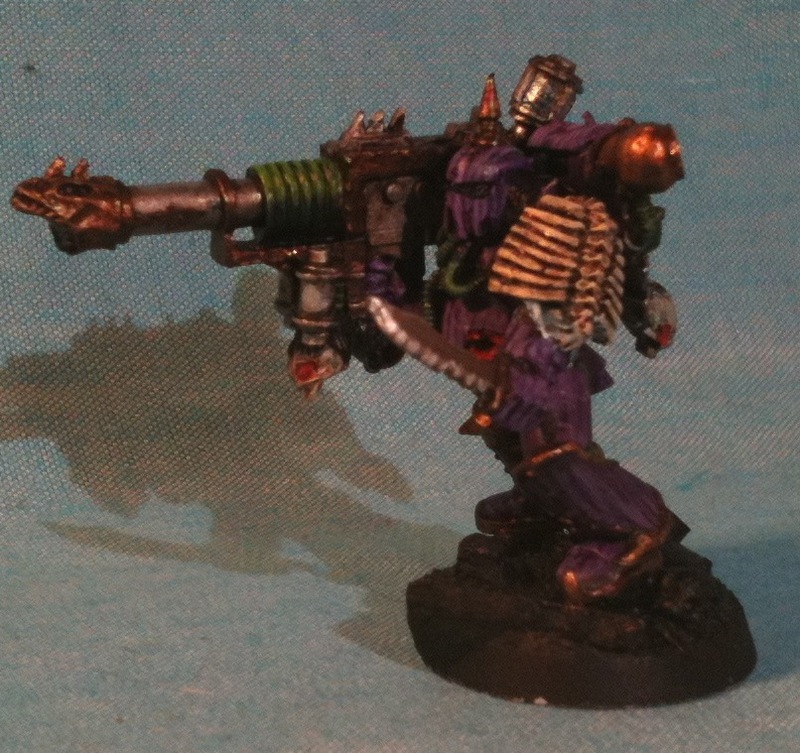 The backpack on the missile launcher dude is the least finished besides the bases. I have to figure out what colors to paint the missiles and the grenades attached to it. I kinda don’t want to do them metallic, I’m thinking an army green for the grenades and maybe black and yellow for the rockets. If nothing strange happens I may get these guys done by the end of tonight. Tomorrow I have a party to attend so I won’t be doing much painting or blogging. It’ll be gone to finish some miniatures for the first time in months. I also posted some almost mainstream hobby news over at Muskblog for those who don’t read it, you might want to check out at least that one post. Oh the Nurglings were painted the two sickly skin tones as well as I did their guts. 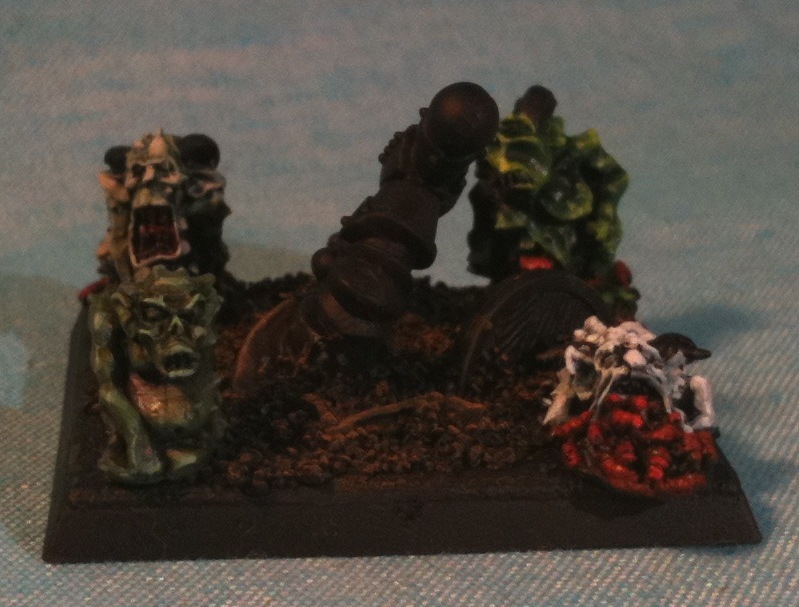 The two other Nurglings were painted similar to two Plaguebearers which I painted months ago I believe.